I had a an unexpected over-night lay-over in Hong Kong last week. The airline did not have its act together, but the Hong Kong Airport saved my proverbial bacon. My flight out of Shanghai was delayed by an hour, ensuring I wasn't going to make my connecting flight to Bangkok. I still had my checked bag with me when the delay was announced, and the thought did occur to me that I could extract a change of clothes and pajamas and put them in my carry-on baggage. However, I've been trying to travel light. I'm experimenting with a small backpack instead of a roller bag and bringing two knitting projects instead of five, and one book instead of three. I was also foolhardy enough to believe the counter agent who said I would have access to my bag once I got to Hong Kong, where I would be spending the night. Once I got to Hong Kong, it was already past midnight. The delay had impacted a lot of travelers, some of whom were pleading with ground staff, and a handful who were screaming, threatening, and demanding to speak to supervisors. By 1 a.m., I'd cleared customs and was about to head to the hotel, but I didn't have my luggage. I was told I could wait at the airport another 2 hours for my bag, or it would be delivered to the hotel in the morning. I opted to get some sleep. At 8:00 the next morning, there was still no sign of my bag. As tempting as it was to waltz through the day in a stolen-but-clean hotel robe, I put on my gross, smelly clothes from the day before and headed to the airport. But here's the thing about the Hong Kong airport: It's remarkably like an international shopping mall that just happens to offer world-wide air travel. There's even a Popeye's (specialists in fried foodstuffs and biscuits). The Popeye's is a bit of a unicorn - I've never seen another one in Asia. After inhaling more chicken and biscuits than I really needed to eat on the grounds that it might do something for my (admittedly really terrible) mood, I headed off to Manning's to see what sort of stench-reducing toiletries I could find to make my next flight slightly more bearable for those seated next to me. Manning's is a strange hybrid beast combining elements of a Walgreen's/CVS-esque pharmacy, a Chinese apothecary, and a candy store. If you're heading to any of the sketchy parts of Asia, it's your last chance to pick up genuine sunscreen, bug spray, and over-the-counter medication before you head into the land of fake products. And fake sunscreen is no joke - a red-headed friend was once a victim of fake sunscreen in Malaysia - the photos of her sunburn are enough to make me wince. 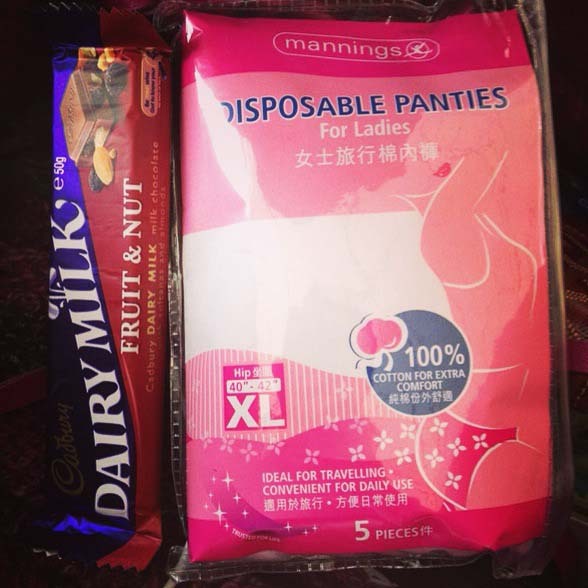 Anyway, the Manning's came through for me: In addition to a wide selection of chocolate-delivery devices, they stock disposable travel underwear specifically for people in my situation, including Westerner-friendly sizing. The sizing thing was a wonderful surprise. If you are a larger person like me (6 feet tall and curvy), it can be really hard to find clothing items that fit in Asia, even in large, international cities. For example, I can't buy shoes in Shanghai because women's shoes are only available up to a U.S. 9. I wear a 10.5, and have been referred to the men's shoe department so many times I've stopped trying to find footwear locally. I never would have guessed I'd find anything I could actually fit into in any sort of pharmacy - much less in a tiny 200 square-foot airport pharmacy. Well played, Hong Kong Airport, well played. Also, I've learned my lesson: Nobody who works for an airline can tell you with certainty what you're going to find when you get to your next destination. I'm going back to a larger carry-on bag with room for spare clothes. And chocolate. Lots of chocolate.